A well-chosen wine can complement and enhance the flavour of a lovingly prepared game or fish dish. For many, a meal involving game or fresh fish is a treat, perhaps reserved for a special occasion. To give your meal the extra wow factor it deserves, be sure to spend some time researching appropriate wine pairings. White wine and fish make an ideal pairing. So which whites to choose? 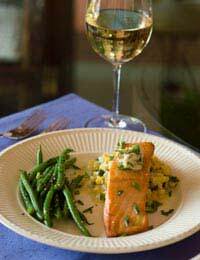 Sauvignon Blanc is a good option for most fish dishes. New Zealand varieties are especially fitting, being light and lemony. Serve these with simple dishes like grilled rainbow trout. Those serving salmon should consider investing in a bottle or two of White Bordeaux. Typically a blend of Sauvignon Blanc and Semillon, this can be paired with richer dishes and more robust sauces. Chardonnay fans should avoid okay versions when serving fish, as the wine’s flavours can overpower those of the food. Opt for Californian or Australian varieties instead. When it comes to fish, it’s hard to go wrong with a quality Pinot Grigio, as the wine’s neutral character sits well with all sorts of dishes. The citrus tang of a Riesling is ideal with white fish, or unsmoked trout. Finally, if you are keen to serve red wine, Pinot Noir can be a good accompaniment to fish, particularly salmon. When tucking into a feast of pheasant, opt for red Bordeaux, a Hermitage or a Syrah. If you’ve opted for duck, try out a Cabernet Sauvignon or a Merlot. If you will be eating roast duck, however, try a Chateauneuf-du-Pape, a Côte Rotie or a quality Pinot Noir. Game hen calls for a Merlot, or perhaps a Beaujolais. Those tucking into quail should consider serving a Bandol, a red Burgundy or a Pinot Noir. Goose can also be served with a Pinot Noir, or alternatively a Chinon. When it comes to roast turkey, opt for a Beaujolais, a Côtes du Rhône or a Zinfandel. A variety of wines can be enjoyed with venison. Try a Cabernet Sauvignon, a Riesling, a Super Tuscan or a Zinfandel. If you’re indulging in a royal feast of wild boar, be sure to take extra care over your choice of wines. Barolo, Brunello di Montalcino and Côtes du Rhône are all suitable varieties to go for. Those tucking into a hearty hare stew would do well to sip at a glass of Cabernet Sauvignon. A Californian variety would work best here. If you are cooking with rabbit, try a Bandol, a Cabernet Franc, a Pinot Noir or a Riesling. These suggested pairings of food and drink are by no means prescriptive. If it’s a special occasion, why not offer guests the choice of two or three different wines? This will enable everyone to see which styles fit both their dish and their palate best. Experimentation is key here. In time, you’ll find that you are able to showcase your fish and game cookery skills by serving wines that foreground the quality and flavour of your dishes.